While many people have an image of Japan being an inconvenient place for people with disabilities, in fact, it is quite the opposite! The following gives you some general information on accessible travel in Japan – no matter what your disability. 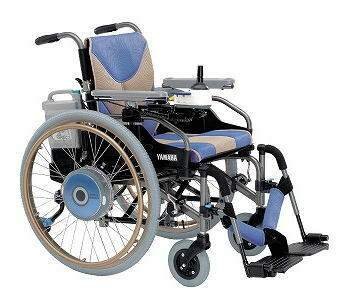 Japan has a number of natively built wheelchairs, including some by Yamaha and Panasonic. The space restrictions in Japan has lead to a type of wheelchair that is a hybrid of manual and electric. While maintaining the general build and weight of manual wheelchair, special wheels with built-in motors are added to provide limited mobility – typically 6km/h with a short range. The benefit is that they are compact and lightweight – and often able to be easily lifted. This fits well with the landscape and culture of Japan. Unfortunately, many foreign wheelchairs don’t fit. The biggest challenge most electric wheelchair users will face is the small aisles, and restrictive space, in many stores and restaurants. This may mean you might have to pass up going to an interesting looking restaurant or looking at a shop’s merchandise from the window. There has been a lot of effort to build slopes in most areas and you will likely not encounter much of a hassle in major centres when out and about. 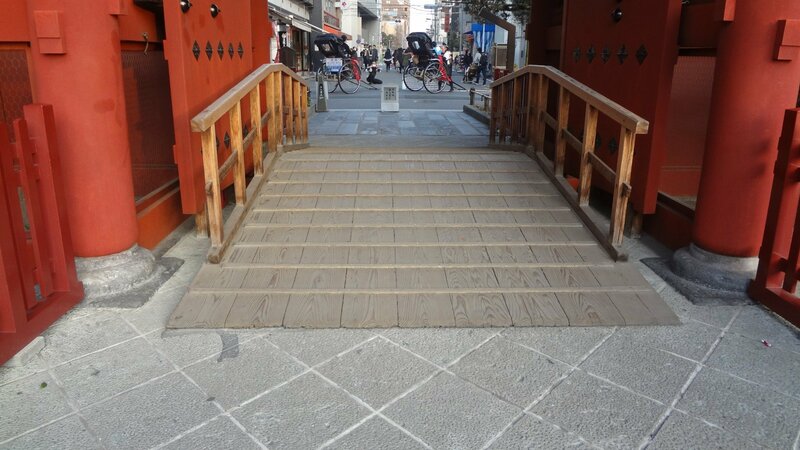 Some clever, culturally appropriate adaptations have been made, such as the wooden ramp at a temple in the top image. All curbs in Japan are cut, but as with any country in the world, sometimes they may be a bit too steep. On smaller streets there is often no sidewalk and pedestrians share the road with cars. In the last 15 years Japan has put a lot of effort into adapting and adding elevators – they even put one in at Sensoji Temple in Asakusa that blends in well! A large number of elevators in high traffic areas have lowered priority buttons. These buttons are lowered and specifically call the elevator that is easiest for people using wheelchairs. These elevators feature buttons that are at a lower level and arranged horizontally so the user does not need to reach high. While those are the great elevators, there are some uniquely Japanese situations as well. The first is elevator size. Some elevators in smaller buildings are literally the size of a wheelchair and are either impossible to use, or require incredible manoeuvring skills! The other issue that occasionally pops up is elevators at the top of a few stairs. The building code in Japan requires any building over 4 stories to have an elevator but does’t seem to care about where! Both of these problems do exist, but for the most part are in smaller buildings and older areas. 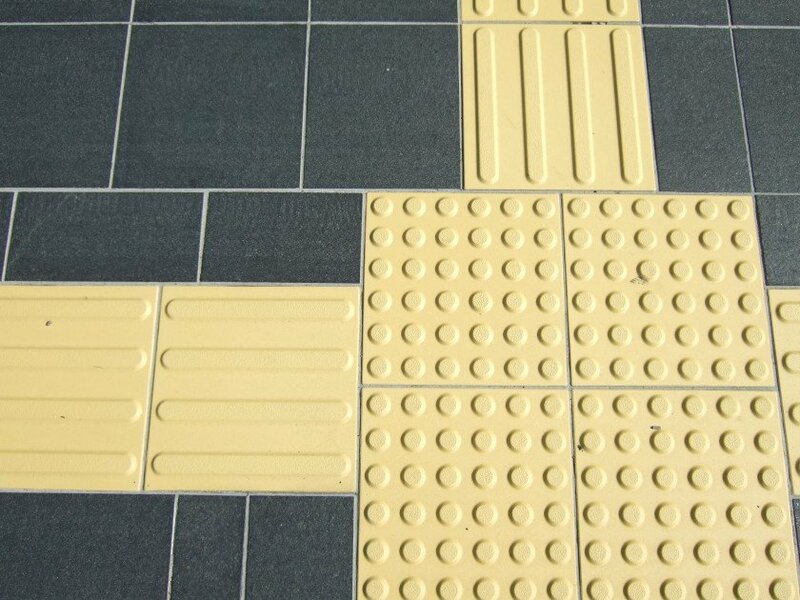 For those with visual impairments, you will be glad to hear that Japan is the originator of tactile paving. 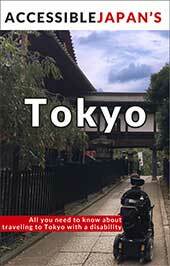 In fact, the first tactile blocks were used in Okayama City in 1967 and then spread around the world. These blocks, called “tenji blocks” (lit. “braille blocks”), are everywhere in Japan. There are two types – elongated lines to indicate path direction, and small circles to indicate caution (the end of a path, train tracks, etc). Japan also has made extensive use of braille. Unfortunately, it is a unique Japanese braille that is unreadable by users of English braille. If travelling by train alone, people with visual impairments can ask staff for assistance when passing through the ticket gates. A staff member will guide you to the train and call ahead to your destination where another staff member is waiting to guide you through the station. People with hearing impairments in Japan sign to communicate, and, as you might expect, they don’t use American Sign Language (ASL)! Japanese Sign Language (JSL) is called 手話 (shu-wa, lit. “hand language”), and though people with hearing impairments have faced an uphill battle for recognition, the “Basic Act for Persons with Disabilities” that came into law in 2011 officially recognizes JSL as a language. Among the growing number of advocates, is Kiko Princess Akishino of the Japanese Imperial Family who is a trained sign language interpreter, as well as Rie Saito a famous politician who chronicled her life as a hearing impaired club hostess. Saving the best for last. While Japan may be (in)famous for its toilets that clean your behind for you, it also has another great concept: the multipurpose toilet. 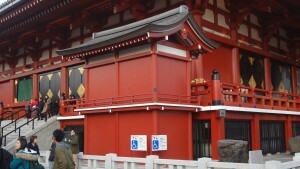 Unlike many other countries that may have a stall at the back of the restroom that is a bit larger than the other stalls, throughout Japan multipurpose toilets are located in-between the men’s and women’s toilet. They are often spacious, feature handrails, facilities for those with ostomate bags, and even a full-sized changing table. (Please note that there is no apparent standard and they can vary quite a bit.) Unfortunately, they often don’t have backrests – making it hard for people with difficulties balancing. These multipurpose toilets can be found across Japan. Almost every train station has at least one, as do shopping centres, public spaces, attractions, museums, many tourist destinations and – thanks to Japan’s safety and cleanliness – even in local parks.